Tamron SP 24-70mm f/2.8 Di USD Sony mount lens review: high image quality but does it justify the price? 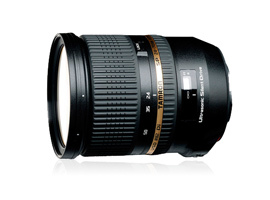 Apart from the fast ultrasonic-type AF and weatherproofing, without doubt one of the most promising aspects of this lens when launched was the inclusion of optical image stabilization. For Sony Alpha users though, who are already accustomed to stabilization with any lens fitted, the new Tamron lens will be less tempting, especially as the price remains the unchanged at $1299. With the new revised version achieving an overalll DxOMark score of 21 points, the Sony mount version performs very well, although not quite achieving the same high scores when compared to the VC version when fitted to either the Canon EOS 5D Mk III or the Nikon D800. 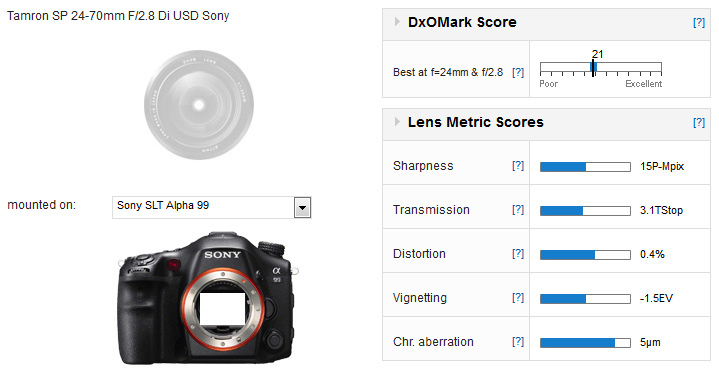 In terms of Sharpness scores the Sony combination matches the Canon but Transmission is lower at 3.1T vs 2.8T while Distortion levels are very slightly higher. The Nikon duo achieves higher Sharpness scores (17P-Mpix), and has slightly lower levels of Distortion but the Sony pair have marginally lower chromatic aberration. As you might expect, the Tamron performs similarly to the Canon and Nikon mount versions with the only real difference in scores being influenced by the sensor. While the Sony mount version has similar sharpness levels to the Canon mount version it’s important to remember the Canon EOS 5D Mk III sensor has a lower pixel count than the Sony SLT A99, ﻿meaning the imaging chain isn’t quite as efficient at resolving detail. Be that as it may, the lens performs very well indeed and remains a good choice for Sony users even if it doesn’t seem quite as good value as the stabilized variants.